Looking for a dog food comparison to provide your canine best friend (or friends) with great nutrition and great flavors? You’ve come to the right place! We’ve researched and reviewed a range of dry and wet dog food choices from top dog food suppliers, all made in the USA! First, check out the following information we’ve included with every dog food review to help you choose. Food Type - Most dog owners are specifically look for wet or dry dog foods, so we included this info with every review. Dog Age - Puppies, adults, and senior dogs have different nutritional needs, so look for a formula optimized for age. 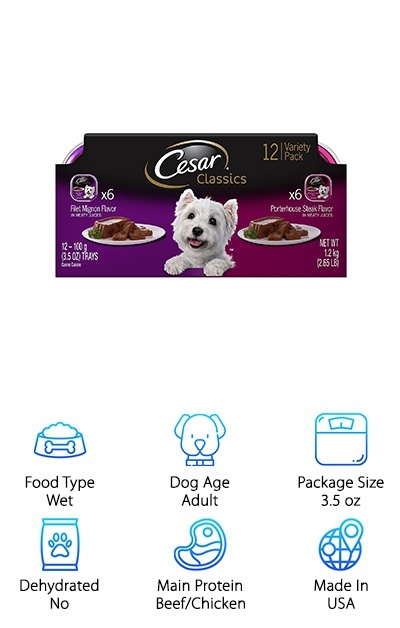 Package Size - How much dog food are you getting? The size of the can or bag can help you find the best value for your dog. Dehydrated - If you want a wet dog food but don’t want to pay for the added water, get dehydrated dog food and add your own! Main Protein - Whether your dog is allergic to poultry or just picky, the main protein source is an important deciding factor. Made In - With dog foods made in the USA, the ingredient and quality standards mean you know what you’re getting! Now that you know more about what you’re looking at, let’s get into the reviews! We’ve compiled a range of wet and dry dog foods as well as an amazing dehydrated dog food option for you to consider, including options for dogs with sensitive stomachs. Give your chow hound the gift of a gourmet meal with no prep needed on your part! Our top pick among exclusive dog food options is the Canidae Grain-Free PURE Dry Dog Food. With a short ingredients list focused on whole foods, it’s a premium dog food option that’s also ideal for dogs with sensitivities. Available in 4, 12, and 24-pound bags, this dog food provides protein from wild boar and pork meal. The other ingredients are just sweet potatoes, peas, chickpeas, canola oil, suncured alfalfa, and a premium mix of vitamins, probiotics, and other nutrients. This recipe is also available in formulas for seniors, puppies, and small breeds. Their facilities are USDA, FDA, and AAFCO-approved and their meats are all USDA-inspected for high quality and high quality control! Including probiotics is a great touch on top of vitamins and minerals to support healthy digestion on top of a beautiful coat, healthy skin, and a strong immune system. This is definitely a top-of-the-line dry dog food! Pamper your dog by mixing a touch of wet food with their usual kibble or give them a full meal of gourmet Cesar Classic dog food! This wet dog food is inexpensive and comes in over a dozen different flavors. If you want an easy way to perk up your dog’s interest in their meals, try cycling between a few different flavors! This dog food meets the AAFCO dog food nutrient profiles for large to small dogs, but the 3.5-ounce cans are easiest as whole meals for small dogs. No can opener required--just peel back the tab. 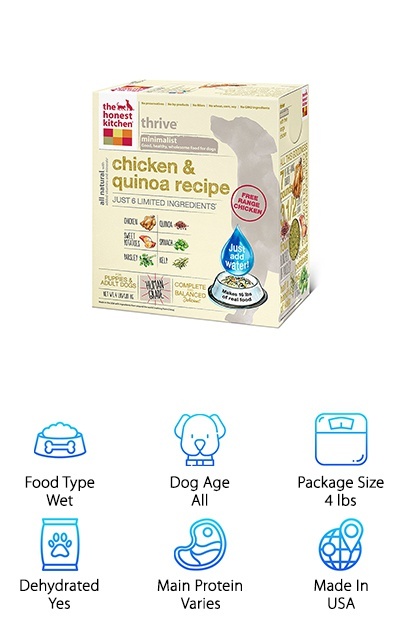 This wet dog food contains a variety of protein sources from beef, chicken, and other proteins. Although delicious, this may not be the right food for your dog if they have food sensitivities, since it has a lot of different protein sources and other ingredients. Available in 4, 15, and 30-pound bags, the Hill’s Science Diet Sensitive Stomach formula provides complete nutrition that’s easy to digest. This recipe features chicken meal and barley and is available in an adult dog formula and a formula for small or toy breeds. Does your dog have food or skin sensitivities? It can be hard to find a dog food that works around allergies and intolerances. The Hill’s Science Diet Sensitive Stomach recipe contains antioxidants and omega-6 fatty acids to support a healthy immune system, skin, and coat. You can also try out the wet food variation of this formula for adult dogs, which features salmon and vegetables. No one likes to see their canine best friend dealing with stomach issues, and an easy-to-digest dog food is often the first step in dealing with a sensitive stomach. This dog food is known among healthy dog food brands and comes highly recommended by vets, too! If you’ve ever seen the ads for Blue Buffalo Wilderness dog food, you probably feel a rush of affection for your dog’s love of the outdoors, even if they’re far from wolf-like. 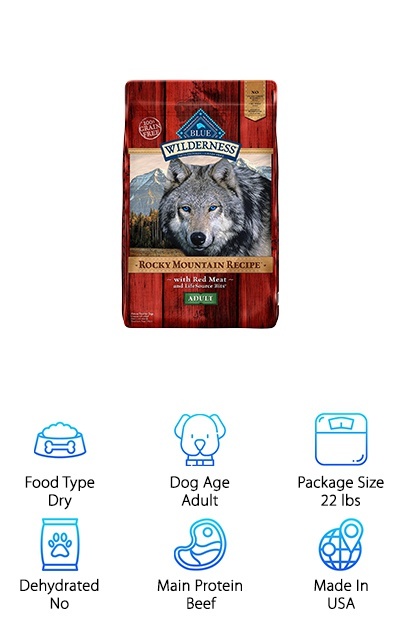 The Blue Buffalo Wilderness dog food, designed for adult dogs of all breed types, is the perfect choice for pet owners who want to thank their dog’s primal wolf ancestors. Of course, the unique protein sources and wheat-free recipes are also a great choice for picky dogs! 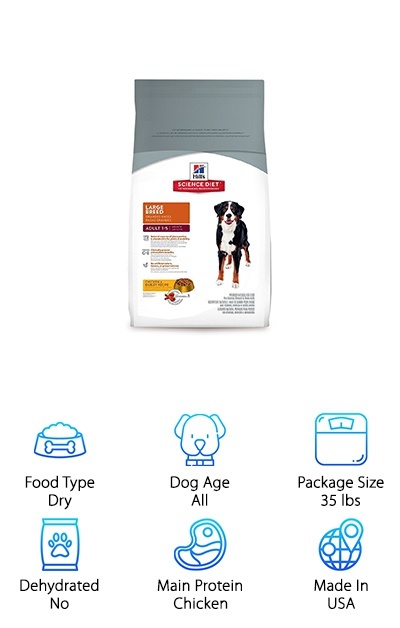 The dry food comes in 4, 20, and 22-pound bags, and it’s all made in the uSA. The Wilderness recipes come in a variety of flavors with protein sources like beef, bison, lamb, and venison. Especially if your dog lives an active lifestyle, a protein-rich dry dog food is a good idea to help them maintain their health and energy. These formulas also contain fruits and vegetables full of antioxidants--a benefit your dog’s wolf ancestors may not have had! 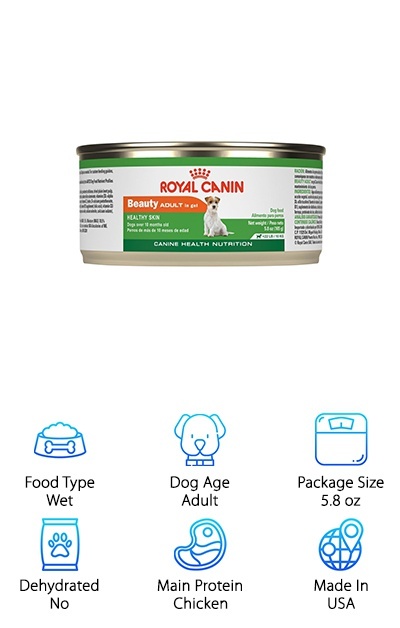 The Royal Canin Adult Beauty Food is a wet dog food formula designed for small breed dogs up to 22 pounds. The cans come in 5.8-ounce or 3.5-ounce sizes. Some people like to mix it with dry food as a special treat, while others use it as the main course. The main protein sources are pork byproduct and chicken, fortified with nutrients and vitamins to support coat and skin healthy. Wet dog food can become necessary for some small breeds that are prone to dental issues. Omega-6 fatty acids and B vitamins provide support for a shiny coat and hydrated skin. If your dog tends to have flaky, dry skin or a dull coat, sometimes a little nutritional boost is all they need! (But check with your vet, of course.) Royal Canin Adult Beauty Food is a great way to pamper your pet the way they deserve, whether they’re a purebred Pomeranian or an adorable mystery mutt! 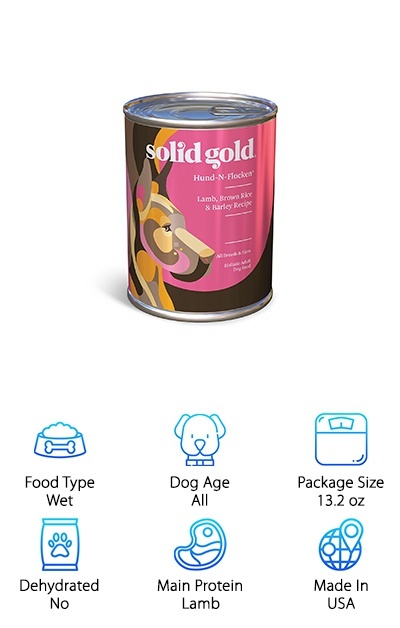 The Solid Gold Hund-N-Flocken dog food is available in dry and wet formulas, but we’re going to focus on the wet food formula. This wet dog food is suitable for all ages and breeds and comes in 13.2-ounce cans. The nutritionally complete formula includes lamb as the as the protein source and ingredients like brown rice, carrots, barley, and various vitamins and nutrients like vitamin B and iron. This is not a grain-free option, but it doesn’t contain corn, wheat, or soy. Wet food is often an ideal choice for picky eaters and also works well for dogs who need to lose weight, since the water in wet dog food “dilutes” the concentration of ingredients. That means they’ll feel fuller on wet food than the same amount of dry kibble--so you don’t have to deal with so much begging! If your pup turns their nose up at the idea of chicken or beef, this lamb-based dog food might win them over! 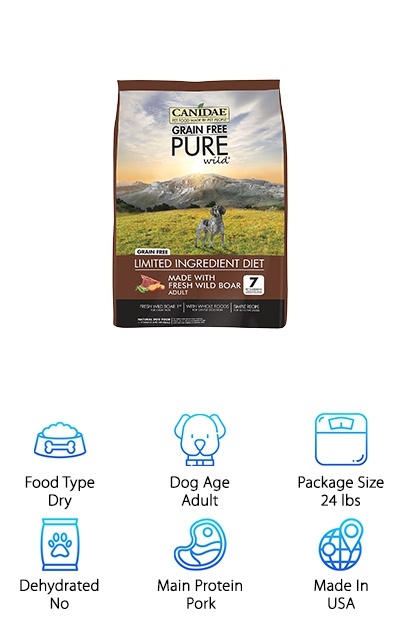 The Hill’s Science Diet Large Breed formula dry dog food comes in package sizes ranging from 15.5 pounds all the way up to 38.5-pound bags. Designed for the higher calorie needs of large breeds, this dog food line comes in formulas for puppies, adults, older dogs, and a “light” formula if your canine companion needs to go on a diet. The natural ingredients have no artificial colors or flavors, and contain beneficial nutrients like glucosamine and antioxidants. Glucosamine and chondroitin are important for joint health and mobility, which is especially important for large and giant dog breeds. This dog food diet is suitable for large dogs with adult weights of 55-110 pounds and giant breeds with adult weights of over 110 pounds. This well-formulated kibble is a great choice for giving your large dog the nutrition they need. It supports their immune system, joints, coat, and more! 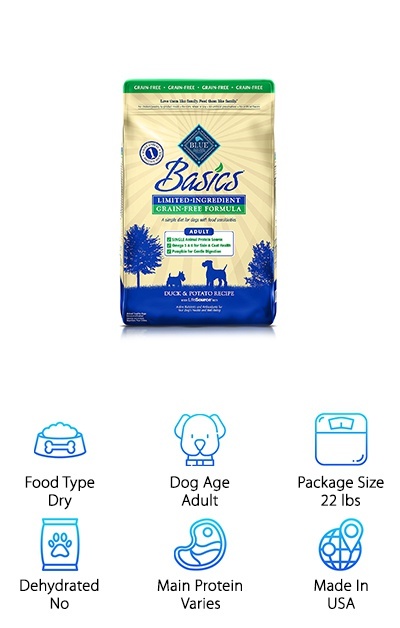 BLUE Basics dog food keeps common allergens and unwanted ingredients out of their dry food formula, which is free of corn, wheat, dairy, soy, and eggs. The Basics grain-free line comes in several varieties, including salmon and potato, turkey and potato, and lamb and potato. These formulas use different animal protein sources than you’ll see in typical dog food, like poultry and beef, so they can be a great way to pamper your pooch as well as take care of various food intolerances your dog may have. Other ingredients like pumpkin, pea fiber, and omega fatty acids support easy digestion and a healthy coat. The Basics line is available in multiple different formulas for adult dogs, small breeds, and large breeds. The bags come in 4, 11, 22, and 24-pound sizes. BLUE is one of the top dog food suppliers and their products are all made in the USA--just one more reason why they may be a great choice for your dog! Do you have a dog that suffers from a sensitive stomach? 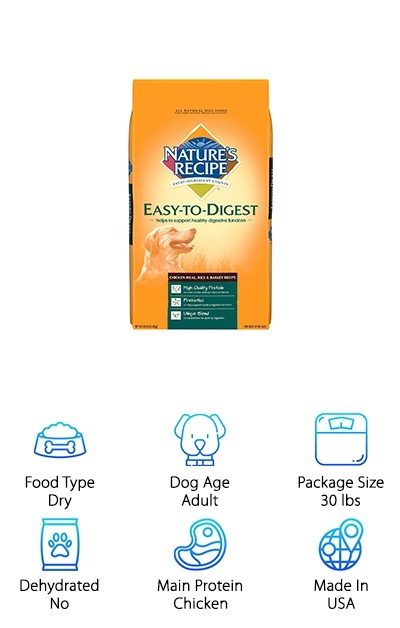 Nature’s Recipe Easy-to-Digest dry dog food provides the nutrition your dog needs with ingredients that are gentle on their stomach. Choose from 4.5-pound, 15-pound, or 30-pound bags of the chicken meal, rice, and barley recipe or fish meal and potato recipe. Besides using ingredients that don’t aggravate sensitive stomachs, this dog food contains prebiotics and natural fibers to help keep your dog’s stomach moving and healthy. The formula is wheat-free, corn-free, and has no artificial colors or flavors. If your dog has stomach issues or other sensitivities, keeping their food simple and free from common allergens and irritants is a must! Chicken meal is one way that this dog food provides the protein your dog needs without aggravating their stomach. The Easy-to-Digest kibble from Nature’s Recipe is a great option that’s available in value-sized bags to suit any breed’s intake. If you’re looking for a minimalist dog food for your active dog, Honest Kitchen keeps it simple with just a handful of ingredients in each of their dehydrated dog food recipes. These recipes include beef and chickpea, chicken and quinoa, duck and sweet potato, fish and coconut, and turkey and parsnip. Dehydrated food is a great way to balance the benefits of a wet food diet (like better hydration and quicker satiation if your pup is on a diet) with a great shelf life and value. This balanced recipe contains the perfect amount of fat and protein that puppies or active adult dogs need to keep up with their lifestyles. 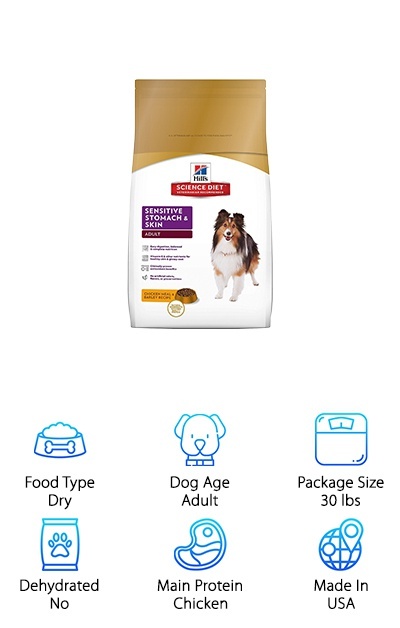 Choose from a four-pound or ten-pound package-- the 4-pound package makes 16 pounds of dog food when rehydrated, and the 10-pound package makes 40! Just add water and your dog will have a delicious meal ready in a few minutes. You might be tempted to try some yourself while your dinner’s still cooking!